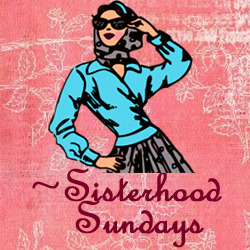 Happy Sunday and welcome to Sisterhood Sunday! Today kicks off the first of the weekly Sisterhood Sunday challenges by the Rubbernecker design team members. We were given the following photo as our inspiration piece. I drew upon the rich colors from the photo seeing Soft Suede, Cherry Cobbler, and Gold for my design. I used this beautiful poinsettia image, coloring it first with Ranger's Fired Brick and then sponging Stampin' Up's rich Cherry Cobbler in the center for depth. I stamped it twice, cut it out, and separated with dimensionals. The center of the poinsettia is a Candi gold embellishment that looks like a brad but isn't (they are cool!) I used brushed gold cardstock for my leaves and then crimped them. I also used the Pine Sprig in the background stamping it first with Soft Suede and then heat embossing it with metallic gold. I also used a Sizzix Flourish embossing folder on the Soft Suede panel. I topped it off by adding touches of gold with my gold leafing pen and then spritzing champagne shimmer mist over the entire piece of cardstock. I felt my gold organdy ribbon needed a little something extra, so I added what was originally gold cord that I colored with a Cardinal Red Copic marker. Please visit the Rubbernecker blog to see what my other sisters from the Stampin' Sisterhood have created for your viewing pleasure and also for details on how you can win a prize! Beautiful Christmas Card creation, Charlene! Love the color combo and that beautiful popped up poinsettia! Hugs! WOW, Charlene...this is dazzling!!!! What a gorgeous poinsettia and I sooo love all the gold!!!! your creation is so stunning and classy! This is drop dead gorgeous! I am loving this elegant creation. Beautiful gold/suede colors on this Charlene and than layered poinsettia is just wonderful! My oh MY!! Charlene, this is entirely gorgeous! The background you've created for this beautiful poinsettia is fabulous!! Beautifully flourished card, I especially love the pine needle embossed background!! You're doing great things with these stamps, Charlene!! Have a wonderful Thanksgiving!! So classy and elegant - wow do I love that gold!! Your design along the bottom is just so beautiful -- and that flower......AMAZING! GORGEOUS!!! That gold looks so elegant and classy, with the pop of red for the poinsettia. Loving the look of the shimmer mist and the leafing pen too!